The Foundry system will be turned off starting today. Players who have played one or more Foundry Missions will receive a Foundry Badge for their characters. Players who have authored a Foundry Mission will receive a Botany Bay non-combat space pet. 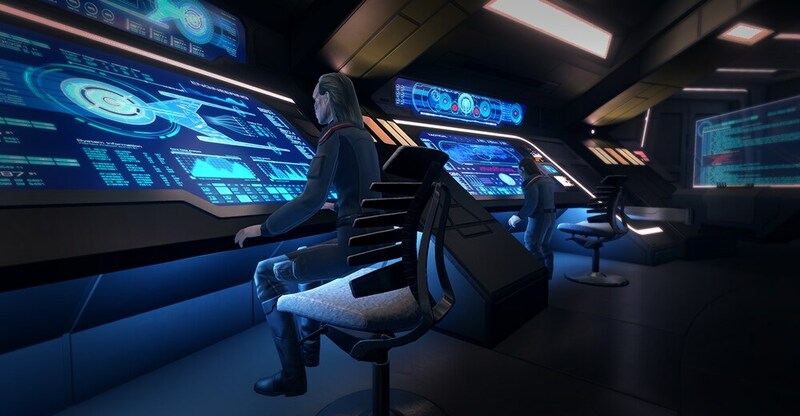 Players who have been selected for a Spotlit Mission will receive a Foundry Spotlight, and a Genesis Torpedo Ground Device. The Infinity Lock Box, containing prizes from nearly all previously-retired Lock Boxes, will be available again. It is now easier than ever to acquire a Lock Box! For the first time, you’ll be able to get the current lock box – in this case, both the Emperor’s Lock Box and the Infinity Lock Box free in the Dilithium Store. There will also be a bundle of twenty of each box, also for free, in the C-store! The Tholian Orb Weaver has been removed as a choice from the "Infinity Prize Pack: T5 Ship" package, and the Tholian Recluse Carrier has been removed from the Lobi Store. The Tholian Jorogumo Carrier [T6] has been added as a choice to the "Infinity Prize Pack: T6 Ship" package, and the Tholian Iktomi [T6] has been added to the Lobi Store. Updated contents of Infinity Lock Box to include items from the Swarm Lock Box. This run of the Infinity Lock Box will feature Tier 6, level scaling versions of the Tholian Orb Weaver and Tholian Recluse Carrier. Removed the clear primary mission button. New missions added will now always become primary. Buying single ships that are part of Mega Bundles no longer block players from buying the Mega Bundle the ships are part of. Services is now titles Slots/Services. Appearances is now titled Uniforms. Expansion Packs is now Expan. Packs. Resolved an issue that was causing the "On Sale" category to not load in properly the first time opening the C-Store. Resolved an issue that was causing the class icons to be incorrect for TOS and Dominion Captains during Character Creation. Now added glowing arrows to the crate you must interact with to get your starter armor, and to the console you must click on to proceed afterward. Resolved an issue that could cause the armor crate to have two buttons if you got your armor, then discarded it and went back to the crate for more. Armor crate now says "Retrieve Armor" instead of "Retrieve Supplies." Resolved an issue that could cause performance issues when opening Personal Endeavor rewards. Added a Cross-Faction Bundle: Mirror Crossfield Science Destroyer Equipment to the Lobi Ships & Crew Store and the Agonized Subatomic Disintegrator to the Lobi Space Equipment store for Klingon-Aligned players to purchase.